“For a society of “buena vida”: for a global ethic”. 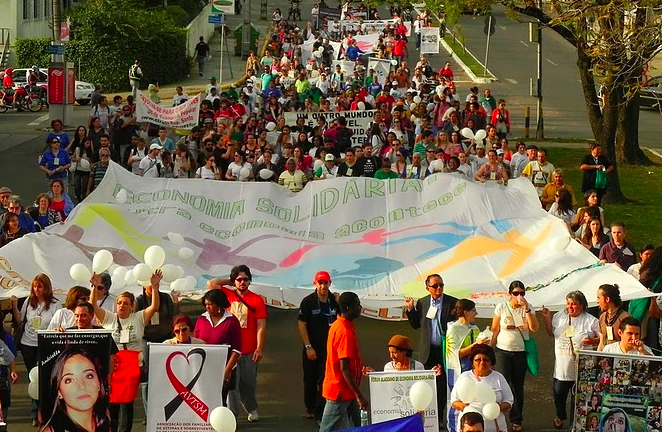 This was the slogan under which the 3rd World Thematic Forum of Solidarity Economy, as well as the XXV International Fair of Cooperativism was held in Santa Maria, in the South of Brazil was held. It took place from 12th to 15th July 2018 in the Dom Ivo Lorscheiter solidarity economy reference centre. The centre represents the scope of the solidarity economy movement as well as one of the focal points of impacts and attacks by conservative forces’ that have aimed at implementing political regressions against peoples’ rights. The forum welcomed representatives from 25 countries (Argentina, Austria, Bolivia, Brazil, Chile, Colombia, Cuba, Ecuador, France, Hungary, Italy, Japan, Mexico, Paraguay, Peru, Portugal, Senegal, Spain, Taiwan, Uruguay, Nicaragua, Pakistan, the United States, and Venezuela). There were more than 302,000 visitors and participants. Over 10,000 varieties of products and services were on offer, and approximately 1,000 exhibitors represented more than 3,500 companies. The forum brought together a multitude of actors: cooperatives, trade unions, indigenous peoples, public administrators, social incubators as well as universities and national and international solidarity economy networks. The forum included a large number of seminars, debates, workshops, training on topics such as Ecosol or the consolidation of a new development model. FBES organised a Solidarity Economy Forum that included a national meeting of Ecosol companies, including over 250 companies from all 27 states of Brazil. RIPESS LAC was present in the activities of the Campaign for a Global Curriculum of Social Solidarity Economy and the presentation of the World Social Forum of Convergence of Transformative Economies, that will be held in Barcelona in 2019-2020. We also have been involved in the FBES Forum and the Brazilian Network of PICT (Technological Incubator of Popular Cooperation) that brought together more than 40 universities. These 4 days represented a great global gathering and an opportunity to build and dialogue in a process “learner / teacher” with diverse cultures, ethnic groups, segments and popular movements for a society of the “buena vida” and a global ethic.